No modifications to the game today, just playing the original game, reading wikia and thinking of ideas for extention. Here's what I have so far (I will include this progressive file with the game from now on). I welcome any ideas you have, I've already had some great suggestions on the Quest For More Glory Facebook page. 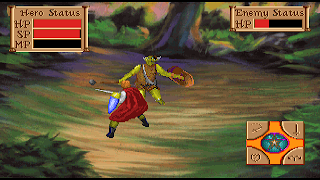 -Get Ogre Shield for giving to the Ogre (maybe have him knocked out rather than killable). 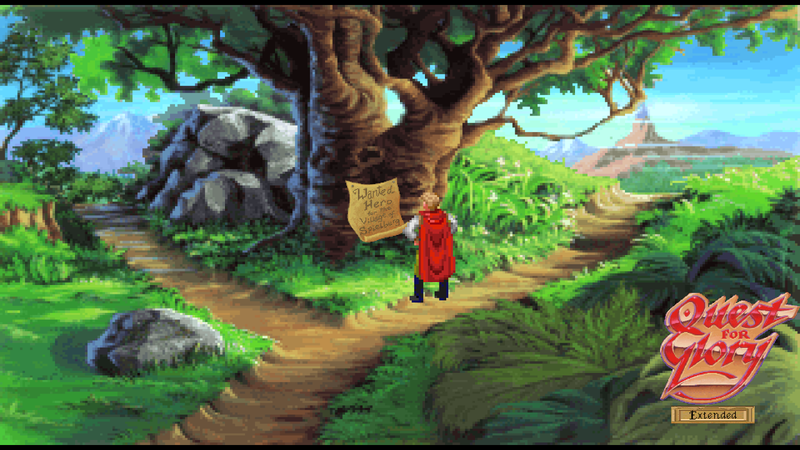 -Make his book 'Quest For Glory: A Hero's Death' purchasable and readable. -Whem you die this book will add your death ways to it. Try to complete the books with all the ways to die. -If you meet Erana in Erana's peace she can then resusitate you from death, but it needs to cost something, this is how you fill the book in. -Can use mouth on self for introductions QFG3 style. he is in cahoots with the brigands or afraid of even speaking about them. -Maybe Bruno can be his regular customer (dodgy dealings), he is rich it says. -Kaspar always wanted to be an adventurer, maybe the hero can take him on one. village and break the peace spell over it. With light you should be able to win the brigands back to good works. Choices are good. -Convince Hilda's dad to let you take her on a date, or just wait a year as she said. -Have a night guard patroling this area, sneak past him. -Stealing from a beggar is not a heroic action but in this game you can be infamous. -Achievement 'Make a Beggar Rich' Give a lot of money to the beggar. -Gain honor from giving to beggar. -Baba Yaga is jealous of beauty, she could capture Hilde and Hero rescue her. -Honor Stat and ability to become paladin. -Night Gaunts should be fightable, they wake you from your sleep and are very hard. -Ask for forgiveness for theft if you have enough speech stat. -Tame the Pterry and help it grow to a full size one as seen in the South. -Can hit the castle with high enough throwing. Get distant complain from guard and achievement. Achievements can be cashed in for some unique prizes the Adventurer's guild. -Zara is half-human half-fairy, therefore it would make sense to have a quest involving her and the fairies. Maybe the fairies don't accept her as their own and you can help Zara. (Although I read she is meant to be an emmisary to the fairies, could make this later). -Zara needs some more backstory about her weird human/fairy parents. -Needs 'What does the Fox say?' reference. -Needs explaination as to why Fox magically disapears when attacked, is is a spell of Erana to test your honor? -Seems like Erana is a sort of God-like being in this game, she could decide which actions are honorable and reward them. -Fox should come back to help you later (seems that they didn't really finish this part). -Needs to be fightable but not killable. He should respect you afterwards and give you something else. -He talks of mead, could offer this to him and drink it with him.